Cloudy headlights can occur on any vehicle over time. The number one main cause is ultra violet light from the sun which eats away at the plastic. Consequently, living in Australia it’s impossible to avoid. Why do some headlights on different makes and models deteriorate quicker than others? Easy answer, plastics used for headlight lenses are manufactured all over the world and not all accomodate for the extreme heat during an Australian summer. Whilst you may not see the importance of restoring cloudy headlights, you will be astonished how much it will improve your vision when driving at night. As the lenses become cloudy over a long period of time, you barely notice it happening. Unfortunately the police may have a different view on how bad they are, worst case this could lead to your vehicle being defected. Not only is this an inconvenience but can also be rather costly. Compare the cost of having your cloudy headlights restored with the cost of vehicle inspections and the like! On the up side, there is a quick and easy fix to Cloudy Headlights………. For the purpose of improving the headlight performance the technician will use professional grade products. In 5 easy steps the restoration will be complete for safe driving on the roads. Generally a headlight restoration can be done in your driveway, workplace or our workshop. All we need is access to power and an hour with your car. That’s right, it only takes one hour to restore the lenses to a sparkling finish. 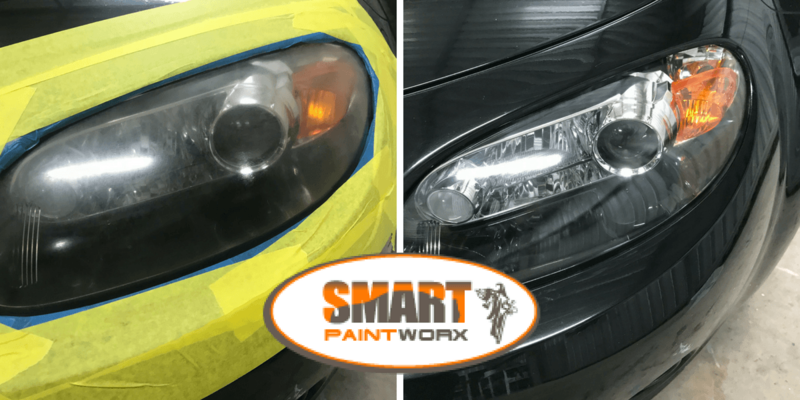 Wanting a quote for your dull, cloudy, scratched headlights to be restored then call SMART Paintworx for a free no obligation quote. This entry was posted in Cloudy Headlights and tagged cloudy headlights, headlight restoration. Bookmark the permalink.